Daughter of George Brooke, fourth Lord Cobham, by his wife, Anne Bray, sister of William Brooke and niece of Sir Thomas Wyatt. She openly lived in adultery with William Parr, Marquess of Northampton and bigamously married him. At times, she was accepted at court as the Marchioness of Northampton. She was the sister-in-law of Catherine Parr, Henry VIII's sixth wife. During the reign of Edward VI, she performed many of the duties a queen would usually do, e.g. meeting ambassadors, as she was the wife of the second most important man at court. She was allegedly the person who began the plot to put Jane Grey on the throne of England instead of Mary I. Her first cousin, Thomas Wyatt, was the leader of a rebellion against Queen Mary known as Wyatt's Rebellion. The whole family were implicated. She became one of the most influential courtiers again during the reign of Elizabeth I.
Elizabeth was described as bubbly, kind and the most beautiful woman at court. Her relationship with William Parr, Catherine Parr’s brother, would shape the politics of England for many years to come. Elizabeth Brooke was around fourteen years old when she arrived at court as a maid-of-honour to Queen Catherine Howard. Her aunt and namesake, Elizabeth Brooke, was notorious as her husband, Thomas Wyatt, had left her after he discovered her adultery. The day after Catherine Howard was condemned to death for adultery, the Imperial Ambassador wrote that Henry was paying particular attention to the elder Elizabeth Brooke, and that 'she had wit enough to do as badly as the others if she wished'. She was thought to be a possible candidate for wife number six. Soon one of the courtiers, William Parr, caught her attention. William had been a close friend of Henry VIII’s illegitimate son, Henry Fitzroy, Duke of Richmond and was well liked at court. He was a married man, but he had already had an affair with another lady-in-waiting, Dorothy Bray, that had been widely gossiped about at court. Parr was to become the love of Elizabeth’s life but by choosing him she wrecked her chances of a good marriage. Elizabeth fell in love with William Parr around the time that the King chose William’s sister, Catherine, to be his sixth wife, and the relationship quickly became common knowledge. As he was now the brother-in-law of the King, he was a favoured person at court and so would have been a good catch for Elizabeth – if he was free to marry. His marriage had been a disaster from the start and while his wife got pregnant by a church prior and set up home with him in 1541, William happily spent his time in the arms of a succession of ladies-in-waiting. Elizabeth doesn’t seem to have cared that she could have attained a respectable marriage if she had played her cards right. She stayed with William for another six years before they went through a ceremony of marriage and she does not seem to have regretted choosing love over advancement. In the end, she achieved both. It is unsurprising that Elizabeth seems to have pursued the attractive, witty and charismatic William Parr. He was the consummate courtier and friends with many of the leading lights at court. Henry called Parr ‘My Integrity’ – before he fell for Parr’s sister – as he could trust him to tell the truth even if it was not what the King wanted to hear. It was a brave man who could be this candid with Henry VIII. Despite Henry’s four annulments (Henry annulled his marriages not only to Catalina of Aragon and Anne of Cleves, but also to Anne Boleyn and Catherine Howard days before they were executed), divorce was still not possible for the average courtier. The affair became well known and Lord Cobham was ensuring that people kept a close watch on his wayward daughter. The last thing he needed was another major scandal in the family after the infamous behaviour of his sister. Perhaps because he hoped to find a suitable husband for her or because of who the queen was, Cobham did not remove his daughter permanently from court. Henry does not seem to have offered his brother-in-law any support in obtaining an annulment as he believed strongly that marriage was a bond that could not be broken – unless it was he who wanted to rid himself of an unwanted wife. After Henry’s death, William and Elizabeth were in a stronger position. William was the beloved uncle of the new boy king, Edward VI. In the jostling for positions, Parr was made the Marquess of Northampton and began to pressure the council into giving him a divorce. For Elizabeth, spending five years as the mistress of a courtier, albeit the Queen’s brother, was beneath her dignity. They must also have been very concerned that Elizabeth would fall pregnant, and their child would thus be illegitimate and unable to inherit Parr’s titles and lands. To have not got pregnant (as far as we know) within five years is unusual, especially as people had only a very basic understanding of how to prevent pregnancy. Northampton was a popular man. He was not particularly able, but he had friends in high places. The commission was set up, and included many of the highest clergymen in the land, including the Archbishop of Canterbury. They played for time and at least one of the commissioners, Sir Thomas Smith, was happy to accept a bribe from Parr. The commission many have been hoping for more money, or for Anne Bourchier, William Parr or Elizabeth Brooke to die, which would end the matter. In an age of low life expectancy, delaying techniques often removed the need to solve the problem. Unfortunately for the (slim) chances of the commission’s success, William Parr was not prepared to wait any longer. In the summer of 1548, the Marquess of Northampton secretly married his long-term love. This was not legally binding as his first marriage had not been annulled, so the ceremony changed little. However, it did offer the chance that if a future commission agreed that he had grounds for divorce, any children born to William and Elizabeth could later be legitimised. Around six months later, at the beginning of 1549, this ‘marriage’ became public knowledge. This enraged Edward Seymour, the Lord Protector, who was still recovering from the clandestine marriage of William’s sister, Catherine Parr, to the Protector’s wayward brother, Thomas Seymour. He was unhappy to have his authority undermined again. As head of state during Edward’s minority, any noble wishing to marry had to obtain Somerset’s permission. The two women accused of having helped Parr make the marriage were two other women who Henry VIII had found attractive, Catherine Parr and Catherine Willoughby. Elizabeth was sent to live with Catherine Parr. She remained in that household until Apr 1548, when her marriage to Northampton was declared valid. But Catherine had died in Sep 1548, depriving the newlyweds of an influential friend and protector. Van der Delft, the Imperial ambassador, wrote to the Emperor in Feb 1548 that Parr ‘was obliged by the command of the Council to put her away and never speak to her again on pain of death…he is only spoken of secretly and does not show himself at court’. This did not last long. Elizabeth’s love life always depended on the feelings of the leader of the day – and in 1549 a political coup ousted Somerset and replaced him with Northampton’s close friend, John Dudley, Duke of Northumberland. He was supportive of the couple and on 31 Mar 1551, a private bill was passed in Parliament annulling Parr’s marriage to Anne Bourchier and accepting Elizabeth Brooke as his legal wife. For the first time, the couple could set up home together, in Winchester House, Southwark. Finally, Elizabeth Brooke was a respectably married woman. Elizabeth dazzled as the Marchioness of Northampton, hosting parties, charming ambassadors and being the light of the court. Still only around twenty-five, Elizabeth had reason to be very happy indeed. She had obtained a very high rank, and she was now an influential woman at court, the friend of the regent and the aunt of the King. As Northumberland’s wife had little interest in leading the court festivities, it was Elizabeth who performed the duties that usually went to a queen – and she performed them admirably. In Jun 1550, the French Duc de Vendôme was spending time at the English court and although she was happily (and apparently faithfully) married to Northampton, the Duke was only interested in the beautiful Marchioness – even though they could not speak the same language. He even gave her a present when he returned to France, a chain worth 200 crowns. Their expenditure records show the Northamptons’ love of socialising and sports; their gambling at cards, bear baiting and more cultured events such as plays and musical performances. She is said to have inspired the young Sir Thomas Hoby to begin his translation of Castiglione’s The Courtier, although she did not travel to France with Hoby when he went there in Northampton’s entourage in 1551. Together with Frances Brandon and Jane Guildford, the duchesses of Suffolk and Northumberland, she was involved in the matchmaking that preceded Northumberland’s attempt to place Lady Suffolk’s daughter, Lady Jane Grey, on the throne of England instead of Mary Tudor. As Edward VI became gravely ill, his council became seriously worried. Having taken the country in a more overtly Protestant direction, they were now faced with the prospect of a staunchly Catholic Queen Mary. Elizabeth realised that if Mary ascended the throne, their whole lifestyle, and the validity of their marriage, would be in tatters. Some sources even credit Elizabeth with the idea that Jane Grey, the granddaughter of Henry’s sister Mary, would make a more acceptable queen than Henry’s eldest daughter. The devoutly Protestant Jane was quickly married to the Duke of Northumberland’s son and her sister Catherine was married to Northampton’s nephew and heir, Henry Herbert, son of the Earl of Pembroke. Elizabeth hoped that the Council could then keep control of the country. Elizabeth may have accompanied Lady Jane to the Tower to await her coronation after the death of King Edward VI. Upon Northumberland’s defeat, Northampton was arrested, tried, sentenced to death, and then pardoned at the end of Dec, but all was not well. Bishop Gardiner, released from the Tower by Mary Tudor and restored to his former post as Lord Chancellor, had ordered Elizabeth out of Winchester House, where she lived with Northampton. Forced to borrow money on which to live, Elizabeth probably went to live with her mother, Lady Cobham, or her brother, William, in Kent. When Parr was released from the Tower, he stayed at the house of Sir Edward Warner, the husband of her aunt Lady Wyatt, in Carter Lane. When Sir Thomas Wyatt, Elizabeth’s cousin, led a rebellion against Queen Mary, Elizabeth’s father, Lord Cobham, was also instrumental in the plot, travelling to Romney Marsh to organise things, thus accidentally tipping off the Imperial ambassador; her brothers also confessed to their parts in the plot. When it dramatically failed, the Marquis and Marchioness of Northampton were lucky that no proof could be offered against them. Northampton insisted that he had merely been away on a hunting trip, when he had no doubt been away raising an army. Queen Mary took all of their lands from them, and stripped Northampton of his titles until he was simply Sir William Parr – then she ordered them to separate. Parr was told to return to his first wife, who was now Mary’s lady-in-waiting and close friend. Now Parr was in danger of being executed for bigamy if they saw each other again. Parr was arrested once again, as were three of Elizabeth’s brothers (William, George, and Thomas Brooke). Parr was released for the second time on 24 Mar 1554 and restored in blood on 5 May. The situation would have been complicated if the couple had conceived children, but from all the years they were together we have no mention of a pregnancy. It is likely that William, Elizabeth or both were infertile. Although their marriage remained invalid, Elizabeth returned to Parr after his release and in Mar 1555 they were joint godparents to Elizabeth Cavendish. They existed in considerable poverty for the remainder of Queen Mary’s reign. In 1557 they were living in Blackfriars when the French ambassador, the bishop of Acqs, asked Elizabeth to deliver a message to the Queen’s sister Elizabeth Tudor at Hatfield. It was a warning not to flee to France to avoid being forced to marry Emmanuel Philibert, duke of Savoy. In the last months of Mary’s reign, in what was probably an influenza epidemic, Elizabeth Brooke’s mother, father, and maternal grandmother died and Parr was seriously ill. With Mary’s death, however, Elizabeth’s fortunes took a turn for the better. Elizabeth, who had been a lady-in-waiting to Catherine Parr during both of her marriages, had become close to Catherine’s stepdaughter, Princess Elizabeth. When Mary I died and Elizabeth became queen of England, there was a great change in Elizabeth Brooke’s luck. The new Queen made a point of stopping to speak to William Parr as her procession through London passed his window. On 13 Jan 1559, she restored him as Marquis of Northampton. Her marriage was now declared valid and Elizabeth returned to her ‘honest uncle’ the majority of his titles and lands. 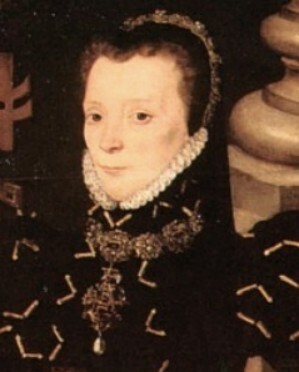 The Marchioness became so close to Elizabeth I that her influence was said to rival Robert Dudley’s. Elizabeth’s importance is shown by the number of surviving letters discussing her illness at this time. She was courted by the Swedish and Spanish ambassadors in the hope that she would support them. In Aug 1562, Lady Northampton was reportedly near death from jaundice and high fever and given up for lost in mid-Sep, but by 12 Oct she had recovered. By 1564, Elizabeth was suffering from breast cancer. Don Guzman de Silva, the Spanish Ambassador, recorded that when Lady Northampton fell ill, the Queen came from St. James to dine with her and spend the day. She was still a beautiful and determined woman and was not going to give up without a fight. With her brother William and sister-in-law, she travelled to the Netherlands, looking for a treatment to alleviate her condition. She had doctors from all over Europe looking for a cure and making a quick buck from promising her a miracle. Queen Elizabeth arranged for the personal physician of the King of Bohemia to attend Elizabeth in England. In Jan 1565, the Queen’s physician, Dr. Julio, took over her treatment. Unfortunately, his man, Griffith, made sexual advances toward Elizabeth, who was still, apparently, “one of the most beautiful women of her time”, and the queen had both men thrown into the Marshalsea. 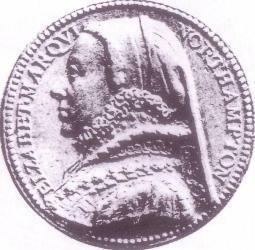 Elizabeth died, aged around 39, on 2 Apr 1565, heavily in debt. The Queen was devastated, and paid for her funeral. Five years later, Northampton married a sixteen year-old Swedish woman, Helena Snakenborg who apparently looked very like his beloved Elizabeth. In Jan 1571, Anne Bourchier died, leaving his union with Helena beyond doubt. Parr died soon after. Collection of State Papers: Spanish, IX, pp.253-4. Collection of State Papers Relating to Affairs in the Reigns of Henry VIII, Edward VI, Queen Mary and Queen Elizabeth, London, 1740, ed. Samuel Haynes, p.62. Strype, Annals of the Reformation, IV, p.485. CSP: Spanish, Elizabeth I, i, 1558-67, p.381; Collection of State Papers…Left by William Cecil, Lord Burghley ed. Samuel Haynes, London, 1740; CSP: Foreign, Elizabeth I (1562), 543.